My parents are visiting us from India for the summer. Mom's amazing cooking skills are reflected everyday in my home kitchen as she dishes out all my favorites. My parents are originally from a Goa, a small state on the west coast of India. It was under the Portuguese rule for about 450 years. This has greatly influence the cooking style based on religion. The Hindus predominantly use coconut, dried red chilies and spices to flavor their fish and vegetables. Whereas the Catholics cuisine has a Portuguese influence of vinegar, tomatoes and meat. My mom's cooking style is predominantly Goan Saraswat. But residing in Mumbai, Maharastra for many years has put a strong influence on her cooking style as well. Today this fusion reflected on her lunch menu as well. 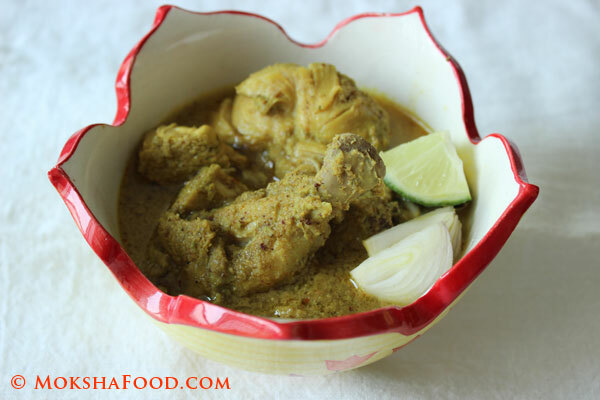 This Sunday she made Chicken Xacuti (pronounced as Shagooti) which is a Goan styled fiery chicken curry served with sliced onions and lime wedges and is usually scooped up with warm bread. 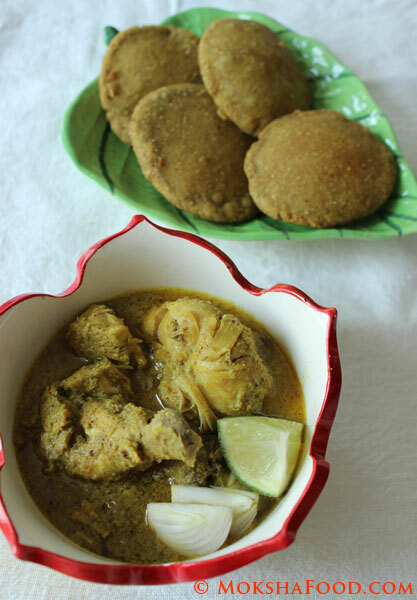 As a variation she served the chicken with Malvani wade, a maharastrian delicacy. 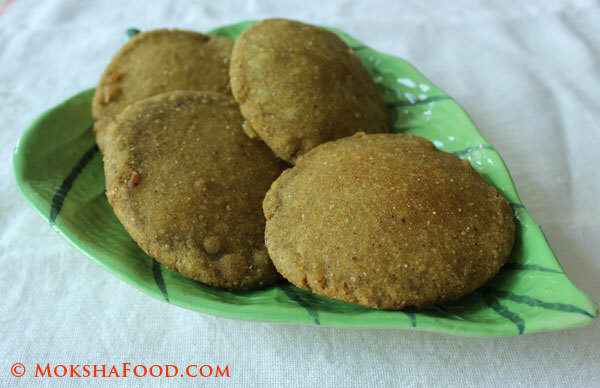 These are protein packed fried dough discs made up of lentils. Its was a match made in heaven. The ingredient list is pretty long with different paste to be made. But all your efforts will be worth it. Grind together the ginger, garlic, green chilies and cilantro. Marinate chicken pieces with chopped onions, ground paste and lime juice for at least 30-40 mins. Roast all spices on mild heat and grind to paste with little water. Saute 1/2 a chopped onion, 2 large cloves of chopped garlic, 1/2 cup grated coconut and 1/2 tsp turmeric pdr in 1 tbsp. of oil. Once the ingredients change color, grind to paste with little water. Heat 2- 3 tbsp. of oil in a large saucepan over medium heat. Add the marinated chicken and 1/2 the required salt. Let it cook till almost done. Add the spice paste and cook for 10 mins. Finally stir in the coconut base paste and cook for further 10 mins. Add the remaining salt and check for flavor. Serve hot with warm bread or wades. Mom bought a premixed pack of Malvani wade flour. She only added water and little salt to make a nice soft but firm dough. Let the dough rest for atleast 2 hrs. 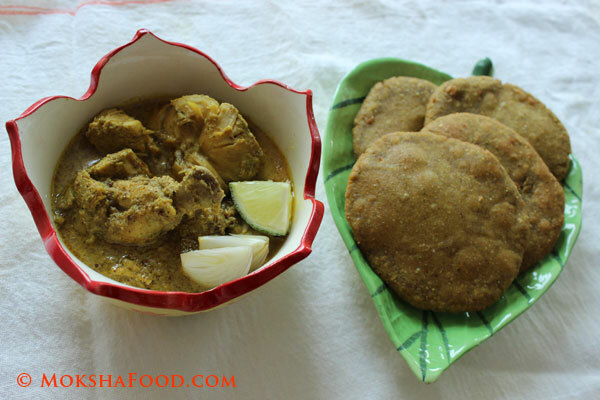 She then patted them on her palms into small disc like puris and fried them slowly on medium heat till done.